This third floor unit has the added advantage of a loft ceiling which promotes that sense of spaciousness and light enjoyed in the tropics. The spacious living and dining areas open onto the large wrap around lanai where you'll enjoy outside dining and stunning panoramic coastal views and amazing sunsets. The oceanfront bedroom with the brand new king-sized bed overlooks the ocean and opens directly to the lanai. The second, mountain view, bedroom sports a queen-sized bed and the unit comes complete with a fully equipped kitchen from which you can also enjoy oceanfront views. The Keauhou-Kona Surf and Racquet Club complex is a gorgeously landscaped, quiet, gated community located on 15+ acres between the Pacific Ocean and the world-class Kona Country Club Golf Course. Our guests enjoy three lighted tennis courts (free for you! ), swimming pool, picnic area, gas and charcoal grills, and we're within walking distance of shopping, restaurants, multi-plex movie theater, and Kahalu'u Beach (aka Turtle Beach) for the best snorkeling on the Island. 180 degree ocean view. Every sunset is yours! 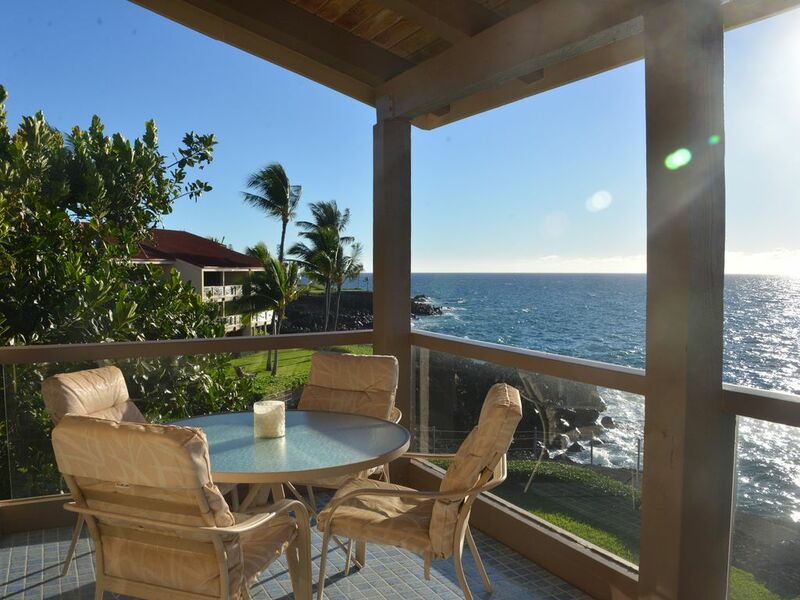 Spend the mornings, afternoons, and evenings watching kayakers & dolphins from your lanai. We even provide the laundry soap! We provide the dryer sheets! Free and secure wifi available in the unit! Surrounded by windows and lanai overlooking the Pacific! There's a FREE collection of books in the newspaper area next to main pavillion. You can find magazines or pick a book or more to read...free. 15+ acres of lovely landscaping for you to explore in this lovely complex. Kayaks can be rented nearby! Three, free and lighted tennis courts for our guests. Pro lessons also available. Yes, we have WIFI in the unit directly. Secured for our guests! Our second stay at the Surf & Racquet club. An excellent and relaxing location for a true vacation. We are looking forward to next time. Thank you so much for honoring us with a second visit and for sharing your kind words and experience on your stay. We couldn't agree more - the Surf & Racquet is perfect for a true vacation. Thanks, too, for always being the nicest and most responsible of guests. Anyone that gets to share their home with you is truly lucky. Wishing you the best New Year in 2019! Great view; it was "as advertised"
We loved the view and the complex. We loved the good quality sheets on the king bed. We loved that the condo had everything included like tennis rackets, snorkel gear, beach chairs, beach umbrellas, boogie board, sunscreen. It was very nice. A perfect vacation! Thank you very much for the feedback! We love that sheets are comfortable as intended and that you found many other items to help you enjoy your vacation! Thanks for being wonderful guests, too! Very comfortable and well-stocked condo. The location is magnificient. We will come back to this condo. Great location for us with the tennis courts close by. We spent lots of time out on the lanai with waves crashing in the rocks right below. Thank you for sharing your feedback and we're always delighted to hear that our guests enjoyed their stay and hope to bless us with a repeat visit. You were very nice to work with and are very welcome to return any time. We really enjoyed our latest trip to Kona. We stayed at #20293 who was represented Sandy W. One of the best view Condo's in all our travel to Hawaii! We have stayed at many rentals in all our travels; this was the best equipped of ANY that we have stayed! Especially the "toys" (beach stuff - bogie boards, flippers, masks, etc.,) It even had an escape ladder, as the place was on the 3rd floor. We would definitely stay there again! Thank you for being such a great guest and for being extra attentive to some details and sharing feedback with us. We loved having you and would be delighted to have you return any time. Loved the location. Far enough south of Kona town to have peace and quiet yet close enough for a quick drive in to go to a restaurant or do some shopping. Also, just a couple of minutes to a great snorkeling area (not quite walkable if you are carrying chairs, towels, gear, etc.). The complex has a fantastic pool and quality tennis courts and beautiful grounds. The unit itself has a renovated kitchen and bathrooms, which are great. We cooked a lot of meals and the kitchen is well equipped and has many basics including spices, oils, etc. Gas grills are in a common area a short walk from the unit. Aside from the kitchen and baths, the rest of the unit still needs a bit of updating. The old white-ish carpet is worn and stained and the furniture appears to be old and worn as well. Also, the sliding doors and screens are in a very bad state, such that they are difficult to open and/or pop out of the tracks as you slide them. Finally, the lighting is generally poor so rooms are not very bright at night even with all of the lights turned on. The lanai is large and provides outstanding views. It is where we ate all of our meals. Thank you very much for your feedback. We're always delighted to hear that our guests enjoyed their stay, the incredible views and our fantastic complex with the gorgeous pool and tennis courts and gardens! Thanks, too, for the constructive feedback on the sliding doors and carpet. Both of these things take a beating next to the salty oceanfront air (which is hard to complain about because that's why we're here!). The doors had some work done in October 2018 and the carpets are going to be replaced completely in 2019. As always, we'll try to keep up and stay ahead of the ever-present rust (salty air & moisture caused) so that our guests just notice the sensational views. We stayed four nights at this condo in July 2018. -unobstructed ocean view: This condo is on the third floor, and sit at the corner. That means, you are not sharing both walls w/ neighbors. The view from the patio was just breathtaking. We had breakfast every day at the patio. We also saw dolphins swam by in the morning! -Location: there is a small beach (not sandy) in the same facility. There is a huge shopping center w/ grocery store and a movie theater within 2 min drive from the condo. Also there are two state beach parks within 5 min drive. The location is everything. It is NOT in the middle of the busy side of Ali'i drive (Ali'i drive is a main street in Kona) so you don't have any traffic whatsoever. -Quiet: Do I need to say more? I didn't hear any neighbors, car driving by. NOTHING. It was so quiet day and night and it was perfect for me. You can only hear ocean waves!!!! - Amenities: The condo has basic kitchen/bath amenities. They also provide snorkeling gear, sand toys for kids, boogie boards etc. I also noticed quite a lot of condiments/teas etc that previous residents left behind. And they were actually really useful when we were cooking! -No AC: They have two portable fans and each bedroom has ceiling fans. We were okay with no ACs. But for some folks it might be problematic. In the morning, with the ocean breeze, you do not need any fans! it was perfect. I also think, if we have AC, then the windows have to be closed, then you don't hear waves... hmm... do you want that?? -Carpet: It can be pros or cons. The dining area has carpet on the floor. If you have little kids, you know it is a recipe for disaster. I made sure my kids ate at patio all the time, otherwise, the carpet will have all kinds of food stains! -No elevator: Okay, it is totally fine with myself and my family. We don't mind having extra steps! But if you have old folks, if they have issues with stairs, then think again. This condo is on the 3rd floor. Overall, this place was just amazing. We will definitely stay again if we go back to Big Island. Thank you so much! Thank you so much for your wonderful feedback and sharing your enjoyment of the condo and your stay. We love it here and having EVERYTHING you need here or close by (beaches, stores, pool, etc). Thank you, too, for being so cautious about adding stains to the carpet (eating indoors with little ones). You are super considerate and we'd be delighted to welcome you back anytime. CANCELLATION POLICY and INTERNATIONAL TAX FEES Credit Card - International Tax Fees International Travelers will have international tax fees withheld from security deposit. For example: credit card processing for VRBO users in United States is 2.9%; international tax fees are an additional 2% totaling 4.9%. Guests using international card will have 2% of total credit card amount charged with-held from security deposit. No charge on domestic (US cards) regular 2.9%; charge on international tax fee only. Cancellation Policy Our formal cancellation policy is strict - there are NO refunds. Reservations cancelled 60 or more days prior to arrival can have deposit applied to another stay within one year of original arrival date. Cancellations less than 60 days have NO REFUND. On an informal note, we understand that the unexpected can happen and would do our best to rebook any cancelled nights/days and try to offer a corresponding refund. Guests agree to honor all details in RENTAL AGREEMENT upon payment for this rental. Security Deposit Refunds are set to automatically refund within 7-14 days of check-out. Housekeeper will supply information of damage and corresponding receipts if and when necessary. We're lucky that this rarely occurs! Cleaning & Guest Supply Fee - this covers departure out-cleaning & tax fee for housekeeper AND it also covers one time stocking for paper towels, toilet paper, soaps (laundry, dishwasher, dish, hand, bath), plastic wrap, garbage bags, baggies, glass cleaner, dryer sheets, etc. so that guests do not need to purchase these items independently.